Jason Kander (D) [2016 file photo]. 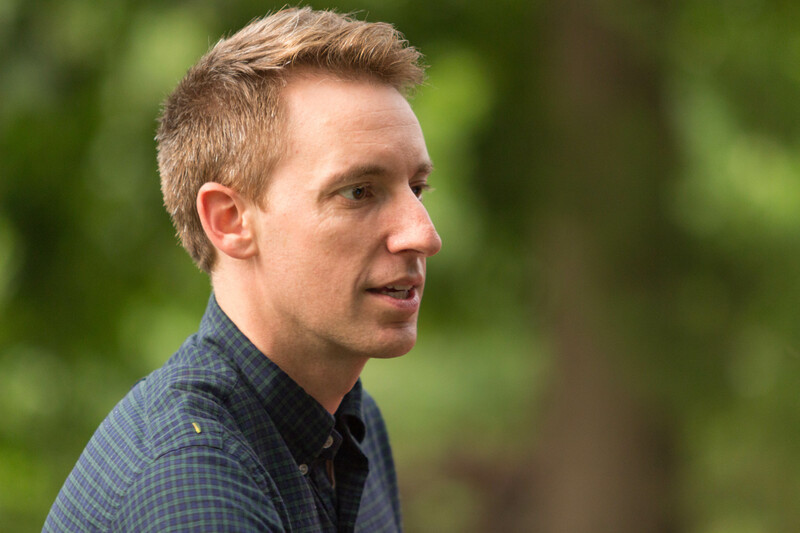 Kansas City, MO – Jason Kander today announced that he will kick off his campaign for mayor of Kansas City on July 14, 2018. Kander, a former Army captain who served in Afghanistan, previously served Kansas City in the state legislature and was elected Missouri Secretary of State in 2012. “Kansas Citians deserve a mayor who can guide the progress already underway in our city and help us reach the next level. I’m eager to take the reins on major issues that have developed in recent years – like building the new airport, implementing the infrastructure improvements voters approved through the GO Bonds, and expanding the streetcar. And I want to make sure we continue addressing critical issues like economic inequality, crime, inclusive housing and economic development, and access to a quality education for every child in the city. “But I also want to tackle problems that aren’t talked about enough, like the fact that too many streets in Kansas City aren’t well lit and are therefore less safe, and that too many residents don’t have convenient access to grocery stores, banks and other basic services. There should be more racial and gender equity in city contracts and programs. City services – from fixing bridges, roads and potholes to customer service across departments – can always be more efficient. “We’ll know Kansas City is at its absolute best when no one feels they have to move from one part of the city to another, or out of town altogether, to live the life they want and deserve. I’m running for mayor of Kansas City because I want to make sure no matter where you live in the city or how you grew up, you have a chance to build a successful life right here. Under Mayor James’ leadership, Kansas City has made great progress, and it is crucial that whoever follows him builds on that success. That isn’t a short-term project, so our city needs a mayor committed to the job for the long haul. If I’m elected, Kansas Citians can count on me to work tirelessly for them every day for four years, and, if they’ll have me, four more years after that. “Diana and I are proud to be raising our son as a sixth generation Kansas Citian. 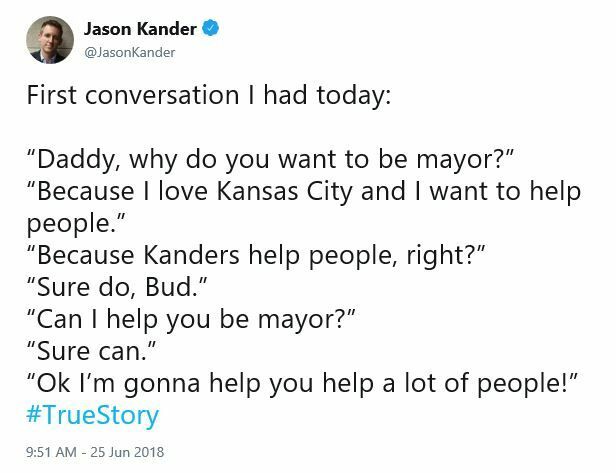 I want to do my part to make sure Kansas City is an even better place to live for him, and every other kid in our city, than it has been for my generation,” Kander said. Kander has the support of leaders from across Kansas City. “Jason Kander and I share a vision of a Kansas City where no one feels they have to move across town or outside the city limits in order to enjoy basic amenities for themselves or their family. I believe as mayor he can turn his passion into progress for every Kansas Citian and I’m thrilled to stand with him in this campaign,” said Dr. Emanuel Cleaver III, Senior Pastor of St. James United Methodist Church. Kander lives with his wife, Diana, and four-year-old son, True, in South Kansas City. Well, that certainly changes things a bit.